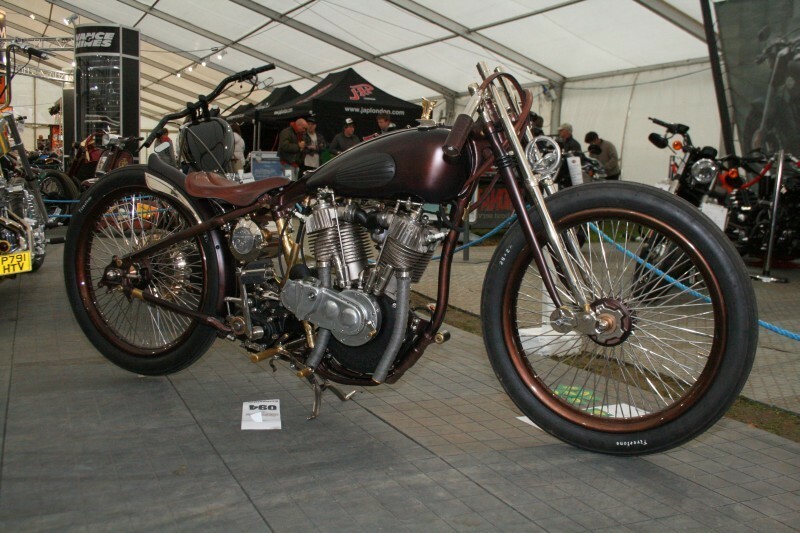 The first UK Custom Show to be staged at the Beaulieu Estate, home to the National Motor Museum in southern England, defied the weather and produced larger crowds and more bikes in the Custom Show than had been expected. 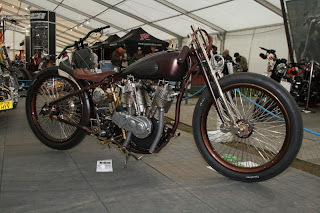 Indeed, those who saw the 90 plus competition entries say that it was the best standard of custom motorcycle design and engineering seen at a show in the UK for several years. The event, which was a follow-up to the "California Dreamin'" show held at the Bournemouth International Centre in 2011, saw a new venue, in a historic country house parkland setting, draw an estimated crowd of around 5,000 visitors for a weekend that also featured Hot Rods and the draw of one of the finest collections of cars and automotive history in the UK. This was the last AMD World Championship affiliate event to see the award of a 'Sturgis prize' before the final switches to AMD's Big Bike Europe expo in Germany in May next year. In fact, thanks to generous Modified Harley-Davidson class sponsorship support from Harley-Davidson UK, the event saw two Sturgis prizes, both being scooped by noted Italian customizers. The Best In Show prize was taken by Milan's Abnormal Cycles (Sam Reali - www.abnormalcycles.com), the reigning Modified Harley-Davidson World Champion, with 'Speed Demon', a universally admired Harley 1930 VL framed 1919 JD 74 inch engined racer. The Modified Harley-Davidson class prize was taken by Boccin Custom Cycles (www.boccincustomcycles.com) from near Venice, Italy - having made a 2,000 mile, four country round trip to try and scoop at least one of the 'Sturgis' prizes, that would have been one very happy van as they headed back across the English Channel! Their 1946 chain final drive Knucklehead beat off strong competition from Nick Gale Custom Cycles from London (second with a 1942 WLC) and 2010 Modified Harley-Davidson World Champion Shaw Speed & Custom (the noted custom design studio operated in East Sussex, England by Shaw Harley-Davidson), whose 2012 1200cc VRSCF subsequently took pride of place at London's prestigious 'Masterpiece - The Best of The Best' summer design and craftsmanship exhibition (www.masterpiecefair.com) ... an event that is definitely not for the financially faint hearted! 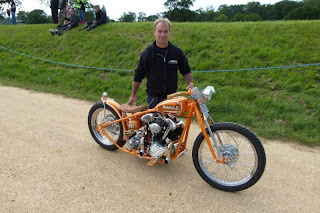 The FreeStyle Class winner was Larry Houghton (www.lamb-engineering.com) with 'Spirit of Endeavour', a stunning hand made follow-up to last year's AMD World Championship runner-up BSA 500 'Son Of A Gun'. Taking JAP engine castings as a start-point, the 1320cc 50 degree all alloy 85 bhp v-twin that Lamb Engineering have developed and manufactured will be offered for customer bikes with a further first five such engines ready now. The engine features many new components developed by Lamb Engineering, including the two twin vane gerotor oil pumps, with all machining done in-house. A 1¾ inch belt drives a 5-speed RevTech gearbox through Lamb's own design primary, and his own-made 26 degree rake zero stretch rigid frame delivers a 56 inch wheelbase and 120mm of trail via a Zodiac International springer front-end, with a detachable hardtail subframe at the rear. Larry says the plan is to build around six bikes a year, either in a bobber style or as café racers using a Metisse frame, and use as many British made components as possible - hence front and rear Harrison Billet 4-piston callipers and Talon 17 inch rims. Second in the FreeStyle Class were Vic & Lin Jefford of Destiny Cycles in the UK (www.destinycycles.co.uk), with another stylish master class in classic 70s Swedish chopper styling featuring stunning paint by Ty Lawer of Pageant, and hand-tooled engraving by legendary British craftsman Don Blocsidge. No strangers to European and World Championship competitions (Vic and Lin even got married in Las Vegas when there for the 2006 AMD World Championship! ), 'Carousel' features a custom engineered Pan/Shovel engine in a 48 degree rake rigid frame with one inch of stretch, a modified Tolle front end and more trail than the state of Wyoming! Winner of the popular Customised Daily Ride class was Calvin Evans with an utterly convincing interpretation of stock sans extraneous equals 'bobber' styling that started out in life as a 1989 80 ci FLTC. The Traditional Period Chopper class win was taken by Clive Ransome of So-Low Choppers in the UK (www.so-lowchoppers.co.uk) with a 1962 BSA A65; the Performance Class win went to Krazy Horse of Suffolk (www.krazyhorse.co.uk) with a 1200cc Sportster engined café Racer built by Paul Beamish and John Gibson. In addition to being one of the UK's leading custom shops, Krazy Horse is also European Importer of the respected Samurai Choppers program, built in Japan by Zero Engineering. The UK market has continued to be a tricky one where custom motorcycle competitions are concerned, with several show projects stalling at various stages of gestation - having either achieved, at best, uncertain results in terms of their ability to convincingly 'speak-to' the custom market, or simply not surviving the economic environment. AMD continues to back those organisers in the UK who are prepared to 'put-out' for the market, who share our desire to see a convincing showcase solution for Britain's custom motorcycle design and engineering prowess emerge. We are happy therefore to congratulate Lorne Cheetham of Ocean Events, Chris Gothard of ESN, and the always hospitable staff of the Beaulieu Estate for giving this event a promising start. Above all we'd like to thank and congratulate all the exhibitors in making the investment to help move the story forward, and all the custom show competitors whose investment in their bikes, and in choosing 'Beaulieu' to show them at have made the critical contribution to giving all concerned something to build on.